If you are a social media freak, you might totally be aware that Dhinchak Pooja is back again to torture us with one more song, ‘Dilon Ka Scooter’ Song. Pooja is back with her bad lyrics, bad voice and of course, with some no meaning rendition. In the past, she came up with Swag Wali Topi, then Selfie maine leli, but now, this ‘Scooter Song’ has totally ruined each one’s life. 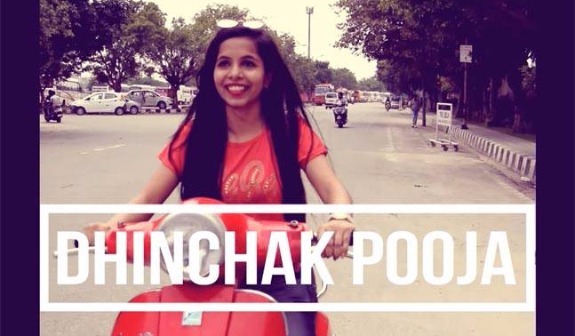 Nevertheless, Dhinchak Pooja is soon going to be in the hands of police, courtesy Mohit Singh. This man tweeted Delhi Traffic Police about Dhinchak Pooja riding her scooter without a helmet. “Aapke sandarbh mein ye mohtarma bina helmet scooter chala rahi hain aur khoob shor kar ke gaane gaa rahi hai“ (This woman is driving without a helmet and singing loudly) tweeted Mohit Singh to the Delhi Traffic Police in Hindi. He also shared a picture of Dhinchak Pooja riding the scooter while singing. The traffic police were quick enough to take the details from Mohit and assured him that action would be taken against Dhinchak Pooja. Now let’s wait and watch what happens next. However, the whole country wants Dhinchak Pooja to be locked up for life so that each one escapes from her torture songs. Previous : These Europe Holiday Pics of Sanjay Dutt, Wife Maanayata Will Give Us Travel Goals! Next : Rs 500 Crore Ponzi Scam: Shah Rukh Khan, Nawazuddin Siddiqui Under CBI Scanner!